BUFFALO, N.Y. (WKBW) — It looks as if we’ll have to wait a little longer for boating season to arrive in Buffalo. The ice boom will not be removed from the icy waters of Lake Erie this week. 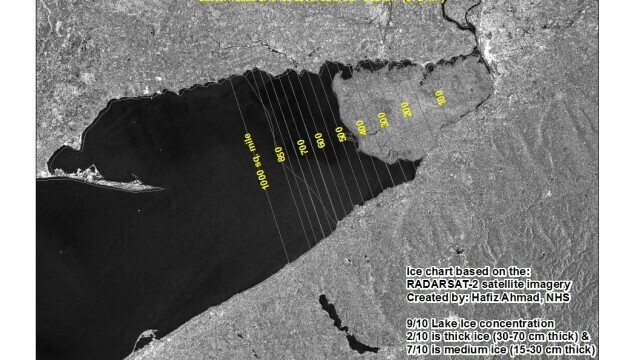 , there is currently 372 square miles of ice on Lake Erie. For crews to remove the ice boom, there has to be 250 square miles of ice or less. Officials also say the ice remaining on the lake is thick. Some of the chunks of ice remaining are nearly six feet thick. each year since 1964. The pontoons prevent ice from flowing down the Niagara River. says the boom reduces the risk of large-scale ice blockages on the river that would cause flooding and damage to property. The earliest crews have taken the ice boom out of the water was February 28th, 2012. The latest the ice boom was removed from Lake Erie was May 3rd, 1971. Crews will continue to monitor the lake ice.